We are a small but efficient game studio based in Finland. Currently, we are developing for mobile platforms. We consist of a core team of 3 people. 2 Developers, both with with 25+ years of experience developing on many different platforms. Before founding Junebit, we did games for Symbian and Android, but it was more as a hobby than serious profession. For Symbian, our titles in Ovi Store had over 3 million downloads. With Android, most succesfull title has ~30k downloads. We have never done any marketing for our titles. 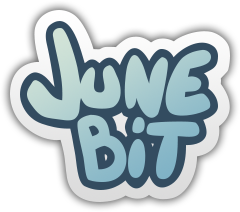 Junebit was founded because I, the current CEO and one of the founders, wanted to bring production quality up in mobile games, and focus solely on game development. I want to make the best game I possibly can, a game that I would play myself, a game I can stand behind and be proud to say: I made it. I feel like I wasn't achieving my full potential when doing games as a side-hobby in addition to my day-job. I am now devoted only to game development, and already think I am achieving much higher quality than before. Our current (and Junebit's first) project is Exire. In it's core, it is a shooter game, with minimal RPG-like elements, like weapon/character developement and some story-like tasks. and this is one of the reasons we are passionate to bring AAA-quality graphics combined with fun gameplay to mobile platforms.